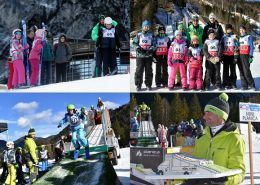 On Sunday, 17 January 2016, the Planica valley was for the fifth consecutive year hosting World Snow Day. 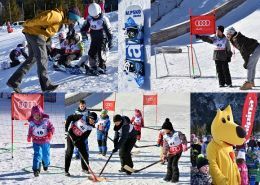 The event was primarily intended for children, who in Planica were able to test themselves in Nordic disciplines - ski jumping and cross-country skiing. They were able to borrow equipment for free and, accompanied by professional guidance, many of them made their first steps in these winter-sports activities. Also Petra Majdic, one of the best competitors in cross-country skiing ever, joined them. She won twenty-four World Cup races, twenty in sprint races, but she also won a marathon (30 km race) in Trondheim in 2009. She is the first Slovenian cross-country skier to win the World Cup race, the first to get a medal at the World Championships and the first to get an Olympic medal. With 20 wins, Petra Majdič is the second-most successful sprinter in FIS Cross-Country World Cup history. 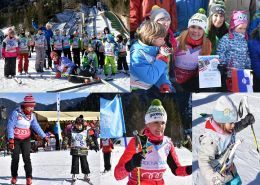 There was also Franci Petek, a former slovenian top ski jumper and World Champion from Val Di Fiemme 1991 who, on his blockbuster of the year - Mini Planica, presented to the children the beauty of ski jumping. For a moment, all the kids became Peter Prevc. Petra and Franci, they are both ambassadors of Planica World Nordic Championships Candidacy 2021. A multitude of other on snow activities were available to children (snowboarding, tubing, sledding, hockey, …). All these free activities made the event certainly entertaining and unforgettable. Our loyal sponsors took care for delicious snacks and prizes. And last but not least, for the first time we also hosted close to 200 kids with developmental disabilities and they made the event even more magical. It was day full of animation, joy and big smiles.